Decision made to shift to OAD milking. Last week’s BCS showed the herd average has dropped from 4.6 to 4.5.The target set is to have the 2nd calvers at a minimum of BCS 5 at the end of May and m/a cows at a minimum BCS 4.5. Currently 31% of our R3’s are BCS 4 and below. As we are unable to draft out lighter cows and treat differently to the rest we are required to put all herds on OAD. Finish remaining Hub silage stack. Next season we switch to baleage only as this is easier to manage on a farmlet level. The silage on farm this season was made over the entire property last autumn. Cow BCS has dropped across the herd from 4.6 to 4.5 average and 31% of our R3 year olds are now at or below BCS 4 despite extra feeding in the shed and the 3in2 milking regime. This means under the same management we will not hit our targets set around BCS at the end of the season, therefore we are required to put everything onto OAD. The four herds are to remain on their allocated farmlets always. The 2017/18 season aim is to feed all cows in a similar manner all season. Any differences to be recorded. PKE/Barley mix offered lifted from 1kg/cow/milking to 1.5kg/cow/day to all cows at BCS 4 or below. Fodder beet will be fed late season as a supplement for milkers in the fodder beet herds only. 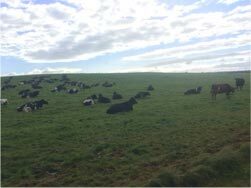 Growth rate measured at 33kg DM/ha/day which matches with average pasture cover (APC) falling.